From my Democratic Underground thread, linking to Harvard, Stanford and Netherlands Tilburg Universities, we have some empirical proofs there's media bias and election fraud harming Senator Bernie Sanders run for President. Was AwfulHere's LINK to US Uncut Politics review of Harvards study on media and the primaries. The perception of the Clinton vs. Sanders race created by the media’s earliest coverage generated an aura of inevitability for Hillary Clinton and encouraged a dismissive attitude toward Sanders despite his early mega-rallies on the West Coast and huge advantage with small-dollar donations. The Shorenstein Center’s study should vindicate supporters of Bernie Sanders and non-Trump Republican candidates alike, as it proves the media’s inherent bias in covering the billionaire real estate developer and the former Secretary of State for the purpose of driving ad revenue and clicks rather than for the purpose of informing the public. Are we witnessing a dishonest election? Our first analysis showed that states wherein the voting outcomes are difficult to verify show far greater support for Secretary Clinton. Second, our examination of exit polling suggested large differences between the respondents that took the exit polls and the claimed voters in the final tally. Beyond these points, these irregular patterns of results did not exist in 2008. 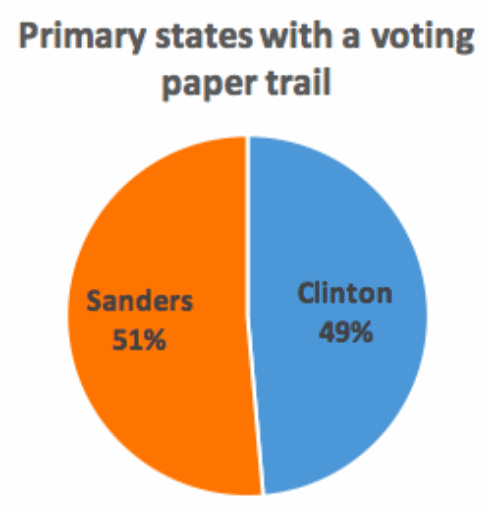 As such, as a whole, these data suggest that election fraud is occurring in the 2016 Democratic Party Presidential Primary election. This fraud has overwhelmingly benefited Secretary Clinton at the expense of Senator Sanders.